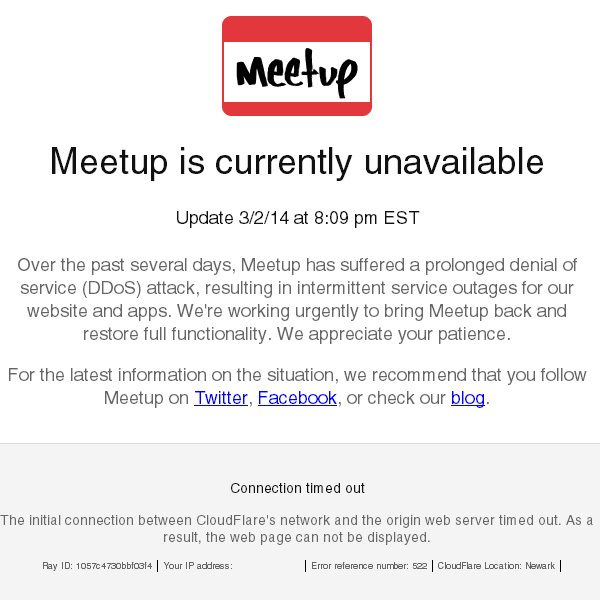 Recently Meetup has been down for several days due to a reported DDOS attack. What’s important to note here is that large sites who have sizable tech resources at their disposal can be brought down. But its not just companies who held at ransom by hackers but the people/customers who use such services for their daily business or activities. Its important at some point to discuss the limitations of internet infrastructure and its policing at the government level. Because the internet is as important to people now as having safe roads. Recently (and including today) Meetup has been down for several days due to a reported DDOS attack. What’s important to note here is that large sites who have sizable tech resources at their disposal can be brought down by malicious persons. But its not just companies who are inconvenienced by hackers, but the people/customers who use such olnine services for their daily business or activities. Its important at some point soon, to discuss the limitations of internet infrastructure and its policing at the government level. Because the internet is as important to people now as having safe roads and reliable power.